Matrix treadmills are the fastest growing brand of commercial treadmills in the world so we are very excited to share these new residential models. 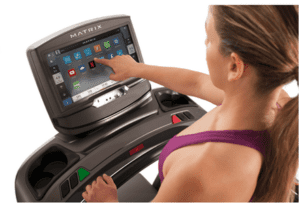 Matrix treadmills come from parent company Johnson Fitness located in Madison, Wisconsin. Our team members recently visited their company headquarters and to say we were ‘impressed’ is a bit of an understatement. Johnson Fitness is the third largest fitness equipment manufacturer in the world. They also produce Vision Fitness and Horizon Fitness treadmills and ellipticals. The company is well known for their excellent customer service, low maintenance machines, and quality products. What Sets Johnson Fitness and Matrix Apart From the Competition? 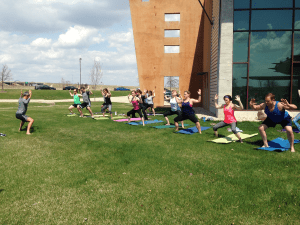 Johnson Fitness employees participate in yoga on the front lawn. Vertical Integration – All of the individual components that go into the Matrix machines are manufactured by Johnson Fitness. These means the pieces are built to work perfectly with each other. In comparison, many completion brands source their components from third-party companies resulting in maintenance issues or parts that wear faster than they should. For the Matrix motors, the benefit of this vertical integration is quite clear. The Johnson Drive System motor runs at a lower RPM than competition brands resulting in a quieter motor that stays cooler. They also have a completely maintenance free tread-belt that has been tested up to 20,000 miles. Awesome Customer Service – While we were receiving our tour of the Johnson Fitness facilities, we were shown to a call center where rows of friendly customer service reps were taking calls. Johnson has a strong commitment to excellent customer service that is not always present with other competition brands. Integrity – Finally, we were impressed by the overall integrity of the Johnson Fitness family. It is obvious that the company cares for their employees as shown by the employee gyms, locker rooms, yoga classes on the lawn, and bright offices. A company that cares about its employees cares about its customers. TF30 – This is their lowest model folding treadmill that features a 3.25 HP Johnson Drive System Motor, Ultimate Deck System, and 20×55” running surface. TF50 – The Matrix TF50 treadmill includes a 20×60” running surface, upgraded belt, soft touch buttons for quick incline and speed control, and a 2.2 mm belt. 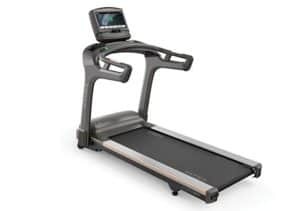 T50 – This non-folding treadmill offers an extremely stable design with a 20×60” running area, 3.25 HP Johnson Drive System Motor and soft touch buttons for incline and speed control. T70 – The Matrix T70 is their top model non-folding treadmill with an expanded 22×60” running surface. It also includes a maintenance free waxed belt, reinforced frame, and an advanced 3.0 HP Continuous Duty AC Drive System motor. Johnson Drive System Motor (TF30, TF50, T50) – One of the common misconceptions we encounter is that a larger horsepower (HP) motor is always better. This notion results in many treadmill buyers purchasing monster machines with 3.75 HP or higher motors that don’t last, are noisy, and have frequent maintenance problems. In contrast, motors from Johnson Fitness are built to operate at lower RPMs. This results in a quieter, cooler motor where all of the motor components are built specifically to work in harmony. The Johnson Drive System Motor re-calibrates hundreds of times per second resulting in a smooth feel lacking surges or lags. The motors also have a lifetime warranty from their company so you can enjoy peace of mind. Industrial-Grade 3.0 HP Continuous Duty AC Drive System (T70 only) – The motor on this top model from Matrix relies solely on magnetic fields (eliminating internal friction) to generate more torque than a traditional DC motor. This type of motor has no need for internal motor brushes or commutators that wear down over time. It runs at only 1735 RPMs – half the RPMs of a DC motor – resulting in a quieter ride. Overall, this motor is more durable and efficient than the standard DC motor. Tread-belts – The TF50, T50, and T70 all have 2-ply tread-belts. The T70 also has a maintenance free waxed belt that has been tested up to 20,000 miles. The remaining models all have silicone lubrication. Industrial Grade Cushioning – Matrix machines have the Ultimate Deck System from Johnson Fitness. The deck is 1” thick and sits on a sturdy frame to support long distance runners. Rubber elastomers like those use on train car bumpers provide durable cushioning along the running surface. Warranty – The Matrix treadmills all have a lifetime warranty on frame, motor and cushioning which is evidence of the confidence they have in their products. The TF30 has an additional 5 years on parts and 2 years on labor while the TF50, T50, and T70 have 7 years on parts and 2 years on labor. Sprint 8 – The Sprint 8 high intensity interval training program was doctor created to deliver significant results in a small time frame. The program requires just twenty minutes three times a week for eight weeks. This program is perfect for people who are short on time and want to maximize their results. 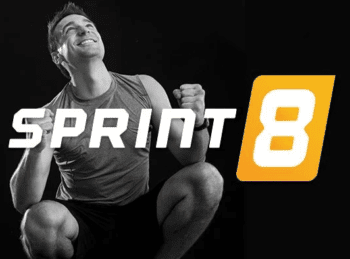 Studies have shown that the Sprint 8 program can deliver a boost in energy, reduced body fat, lower triglycerides, lower LDL, increased bone density, and help develop lean muscle. Sprint 8 is only available on select consoles for the Matrix and Vision machines. Virtual Active and Passport – Virtual Active allows the user to run on a virtual course while the treadmill automatically matches the route’s incline level. Your running route is displayed directly on the screen of the XER or XIR console. Alternatively, you can purchase a Passport Player to link your machine to your TV for a larger viewing experience. Additional routes can be purchased and uploaded to expand your running library. ViaFit Connectivity – Several treadmill companies now offer fitness tracking platforms to help people reach their fitness goals. 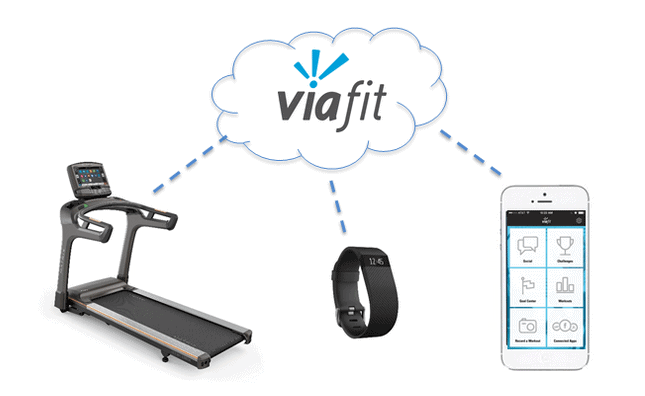 ViaFit is the only program that fully integrates with other fitness tracking devices you may already be using. For example, it will incorporate information from your existing FitBit or MapMyRun app. This free service allows you to track workouts, set goals and even join online challenge groups. Your online ViaFit account and ViaFit app are completely free in sharp contrast to the subscription plans available from some competitors. XIR – The XIR console is the top console available for the Matrix machines. It features a 16” HD touchscreen, built in speakers, 11 workout programs, Bluetooth connectivity, a USB port, and console apps. The console apps are displayed like on a typical smart device for easy use and include Sprint 8, YouTube, Netflix, Twitter, Facebook, Hulu and a web browser. XER – This second level console has most of the same features of the XIR with around a $500 savings. The display is reduced to a 10” touchscreen and the console has only 10 workout programs. 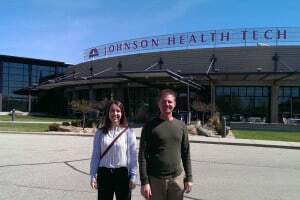 Brad and Rachael in front of Johnson Fitness Headquarters in Cottage Grove, WI. XR – If you’re interested in saving even more money, you may be perfectly happy with the basic XR console. This is usually $1,000 less than the XIR console and includes an 8.5” extra wide blue backlit LCD display and 6 workout programs. Even though the XR does not include Sprint 8 or Virtual Active, a Passport Player can still be used to run virtual courses with the help of your TV. The Matrix treadmills offer four solid examples of commercial quality machines that have been adapted for use in your home. We have absolutely no hesitation in recommending this brand as they are known for durability, excellent customer service, and low maintenance requirements. If you like the Matrix machines, you may also want to check out Vision Fitness or some lower priced options from Horizon Fitness. To learn more, visit MatrixFitness.com. We had the opportunity to visit the Johnson Fitness headquarters in Wisconsin, which is the company that builds Vision Fitness. It is an impressive operation with a staff devoted to quality control, innovation and customer service. All important elements when considering a treadmill brand. Vision Fitness treadmills are tailored towards the discerning customer who wants the very best in a running machine. 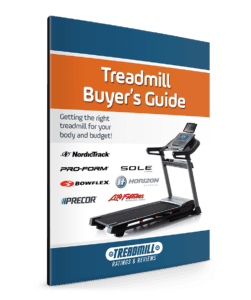 These are not your run of the (tread) mill machines that are purchased from large retailers, but instead these treadmills are part of an elite group that offers commercial grade quality for the home. Johnson Fitness is the third largest manufacturer of fitness equipment in the world. In fact, they are the same company that brings us popular brands: Horizon Fitness and Matrix Fitness treadmills. Choice of Console – This is a unique offering only found on Vision Fitness equipment. You have a choice of consoles based on your fitness needs. And the advantage is that you only pay for the features you desire. Elegant+ Console – In contrast to the Classic Console, the Elegant+ gives you a full color 10” touch screen display with additional interactive features designed to motivate and entertain you as you workout. It includes workout tracking through ViaFit, virtual workouts through Virtual Active and is Passport Ready. There are 15 installed programs, including 4 heart rate programs, Sprint 8 and 2 HD virtual video workouts. Classic Console – This LED console is designed for the user who wants a basic console with minimal features. Why pay more when your intentions are to get on the treadmill, start it up and run or walk, and you’re not interested in fancy displays and additional programming. The console offers 5 popular installed workout programs and is Passport Ready – See Below. The workouts include a target heart rate program and a Polar chest strap. Touch+ Console – The Touch+ console offers all the features of the Elegant+. In addition the display is increased to 15.6”, you have the ability to plug in an iPod or iPhone and play music or media through the installed speakers, and you have a workout tracking calendar as part of the programming. The workout tracking will track your individual workouts. It also includes workout tracking through ViaFit, virtual workouts through Virtual Active and is Passport Ready. There are 19 installed programs, including 4 heart rate programs, Sprint 8 and 2 HD virtual video workouts. ViaFit – ViaFit is available with the Elegant+ and the Touch+ consoles on the Vision Fitness T40 treadmills. If you are keeping up with the latest fitness trends, one of the most popular trends is tracking your health and fitness. The ViaFit is an app that is available for both desktop and mobile devices. As you workout on your T40 the data is pushed into the Internet cloud. 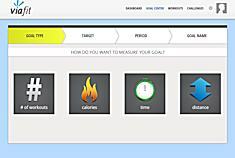 By going to your personal ViaFit.com account you can track your progress towards your fitness goals. Equally important, is that ViaFit becomes a clearing house for other popular fitness hardware like Fitbit, and apps like Fitness Pal and Nike+. With one app you can pull together all your health and fitness stats and monitor your progress towards your goals. Furthermore, you can define fitness goals like calories burned, total exercise time, total distance and number of workouts and through ViaFit you can track your progress towards these goals. Defining fitness goals and tracking your progress is one of the best ways to achieve your goals. Finally, one of the best features of ViaFit is that it is free. A competitor offers a similar tracking package that cost $125 per year. Virtual Active – One of the biggest drawbacks of a treadmill is the fact you run in place and indoors. With Virtual Active your overcome the boredom of treadmill running. Virtual active allows you to virtually exercise outdoors and is embedded in the Elegant+ and Touch+ console . There are two videos that allow you to experience virtually running outdoors in the foothills of the Rocky Mountains and the American Northeast and includes the sounds of the outdoors. The treadmill will incline with the terrain and moves in conjunction with your speed. You have the ability to purchase more videos of additional famous landscapes. Passport Media Player – With the Passport Media Player you have the ability to experience running virtually and watch it on your TV. This feature is basically Virtual Active displayed on a TV. It is available with all three consoles and costs an additional $199 for the media box. Sprint 8 programming on Vision Fitness treadmills. Sprint 8 – Sprint 8 is a scientifically proven workout that is exclusive to Vision Fitness and is available on the Elegant+ and Touch+ consoles. You will find interval training on most treadmills, but in comparison the Sprint 8 program is like interval training on steroids. It is a 20 minute workout designed to lower your body fat by 20% over an eight weeks period. It starts with a warm-up and then alternates between 1.5 minute recovery and 30 second sprint followed by cool down. In the process you are activating muscles and releasing human growth hormones. After the workout it continues to stimulate HGH growth in comparison to other moderate exercises. Sprint 8 was invented by a certified personal trainer and is based on research and study and is particularly beneficial to user over 30 that are experiencing somatopause, “a medical term for the weight gain, loss of muscle, energy decline and wrinkled skin you experience when you hit middle age.” Interval training is also popular with professional athletes in getting the most benefits in the least amount of time. Vision Fitness Drive System – What makes the Vision Drive System unique to the industry is that they manufacture their own key components like motors and electronic boards. Consequently they are engineered specifically for the Vision Fitness treadmills, and this integration makes for an sounder running machine that is less likely to have service issues. The bulk of treadmill manufacturers utilize third party components like motors and electronic boards. Johnson builds some of the best treadmill components in the industry. An example is the 3.0 HP continuous duty motor found on the Vision Fitness T40 treadmill. It is designed for maximum efficiency, which effectively allows the motor to run at low RPM. This results in a very durable motor that comes with a lifetime warranty. 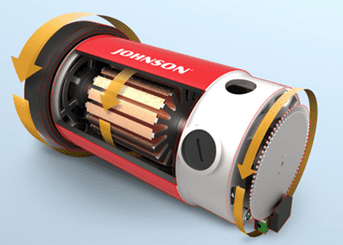 Furthermore, Johnson motors utilize a digital drive which is designed to instantly respond to the push and pull of the belt, thus reducing lags and surges, The motion is more consistent, which then minimizes the stress to your joints. 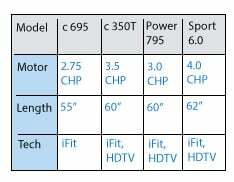 It should be noted that in comparing sizes of motors you will find that many of the lower end residential treadmills are boasting higher HP motors. First, there are no standards for treadmills motors, so they may not actually have a higher horsepower. Second, it isn’t the horsepower that is as important as is the efficiency of the motor. Similar to a powerful turbo 4-cylinder engine found in premium cars. Infinity Deck – Johnson Fitness engineered one of the best deck and shock absorption systems available on a treadmill. They’ve tested it to 21,000 miles and it kept on running. The deck features are extremely important in reducing the impact to your joints and lower back and limiting stress and strain. With too little shock absorption you will get a jolt to your entire body as you impact the deck. With too much shock absorption and you are likely to get reverse shock as the deck bounces back. The Vision Fitness treadmills achieve a fine balance with their commercial grade cushioning system. Most residential treadmill manufacturers use rubber grommets and will have two or three on each side of the deck for cushioning. The problem with this type of cushioning is one size does not fit all. It may work perfectly for medium weight individuals but will not provide enough shock absorption for light weight individuals or too much bounce for heavy weight individuals. Or may work well for walkers but over compensate for runners. Johnson uses a hollowed out elastometers that better absorbs shock based on the weight of the individual. There are three on each side of the deck and are the same elastometers used in Johnson’s $10,000 Matrix brand commercial treadmills. The Infinity Deck shock absorption is designed like a running shoe in reverse, where you have more shock absorption towards the front of the deck where you foot lands and less towards the back where you want a solid push off. A further example of Vision Fitness treadmill durability is that the cushioning system has a lifetime warranty. I am not aware of another treadmill company that offers this coverage. This is a premium shock absorption system typically found on commercial grade machines. The last aspect of the Infinity Deck is the superior treadbelt. The belt is designed with a patented waxing system that never requires lubrication. It is actually woven into the fibers. In addition they use a thicker coating on the deck to further reduce friction and the life of the treadbelt. 268 – 276 lbs. Unit Weight – This is commercial grade heavy and the extra weight insures that the machine will be rock solid for even the heaviest users. In fact, their treadmills are all warranted for users up to 400 lbs. Extended Warranty – Warranties on fitness equipment often reflect the durability of the machines. 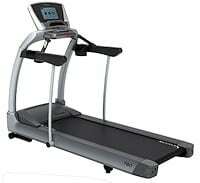 The Vision Fitness treadmills come with one of the most extensive warranties in the industry. You get lifetime coverage on the motor, which is standard, but you also get a lifetime warranty on the cushioning system. Typically you get 5-years. The 2-year labor coverage is standard, but Vision Fitness extended the parts warranty to 7-years for the TF40 and the T40. Overall this suggests their components and machines are going to be very low maintenance, and seldom require service or replacement. Customer Service – Usually fitness equipment customers do not think about the importance of quality customer service until they need it. However, one of the biggest complaints by fitness equipment buyers is poor customer service. Johnson Fitness has some of the most responsive customer service in the industry. When visiting their corporate offices we found the staff took pride in the quality of their customer service and the feedback we have received from customers reinforces their commitment. Vision Fitness TF20 ($2,199-$3,199) – The TF20 comes with a 57? treadbelt and a 2.75 HP motor. You have your choice of consoles. Vision Fitness TF40 ($2,799-$3,799) – The TF40 comes with a 60? treadbelt and a 3.0 HP motor. You have your choice of consoles. Vision Fitness T40 ($2,599-$3,599) – This is the non-folding version of the TF40. If you do not need a folding treadmill you save $200. Vision Fitness T80 ($3,999-$4,999) – This is a heavy duty machine designed to handle commercial demands. The T80 comes with 22” wide treadbelt and emphasizes durability during heavy use. You have your choice of consoles. There are a number of reasons why you would want a Vision Fitness treadmill for your home. First, you are getting a very forgiving workout with the Infinity Deck. It is designed to minimizes the impact to your joints and reduce the stress, and it has the benefit of being maintenance free. Second, you are getting commercial grade durability. Many of the components are also utilized on their commercial grade treadmills, and more importantly the components are built specifically by Johnson fitness and were singularly designed to integrate with their machines. The quality of the components and the engineering are reflected in the warranty. Finally, you are given a choice of the level of interactivity with the selection of the three consoles. If you are a person that just wants to hop on a treadmill and run you can select the Classic console. If you want the ability to track your results, combine data with other fitness platforms and experience virtual running in famous landscapes you have the Elegant+ and Touch+ consoles. You pay for the level of interactivity you desire. Vision Fitness treadmills belong to the upper echelon of fitness equipment. They are built to commercial standards, but sold for residential use. If you want the best in quality, durability and interactive technology, then Vision Fitness treadmills should be a top consideration. To learn more, check out VisionFitness.com.